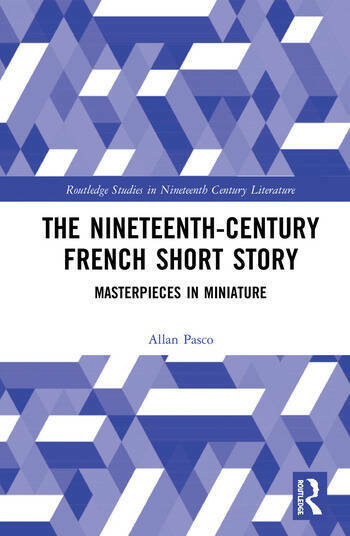 The 19th-Century French Short Story, by eminent scholar, Allan H. Pasco, seeks to offer a more comprehensive view of the definition, capabilities, and aims of short stories. The book examines general instances of the genre specifically in 19th-century France by recognizing their cultural context, demonstrating how close analysis of texts effectively communicates their artistry, and arguing for a distinction between middling and great short stories. Where previous studies have examined the writers of short stories individually, The 19th-Century French Short Story takes a broader lens to the subject, and looks at short story writers as they grapple with the artistic, ethical, and social concerns of their day. Making use of French short story masterpieces, with reinforcing comparisons to works from other traditions, this book offers the possibility of a more adequate appreciation of the under-valued short story genre. Allan H. Pasco is the Hall Distinguished Professor of Nineteenth-Century Literature at the University of Kansas. Specializing in French culture, his critical and historical orientations are rooted in literature. The 19th-Century French Short Story focuses on reasons for the power of the French short story, and follows his earlier consideration of novel forms, Inner Workings of the Novel. Professor Pasco has published ten books on Proust, Balzac, romanticism, allusion, concepts of affection, aesthetic forms, and the thoroughly revised, expanded second edition of his anthology of nineteenth-century short stories. His articles have appeared in such journals as French Studies, Modern Language Review, PMLA, New Literary History, and the Revue d'Histoire Littéraire. While serving on eight editorial boards, he was recognized with the Civilian Service Award by the US government, and has been listed both in the Marquis Who's Who in America since 1999 and, more recently, the Albert Nelson Marquis Lifetime Achievement Award. He has also been named a Chevalier in the Ordre des Palmes Académiques by the French government.